The Spectacular K-1 User Mode Sharing Service! 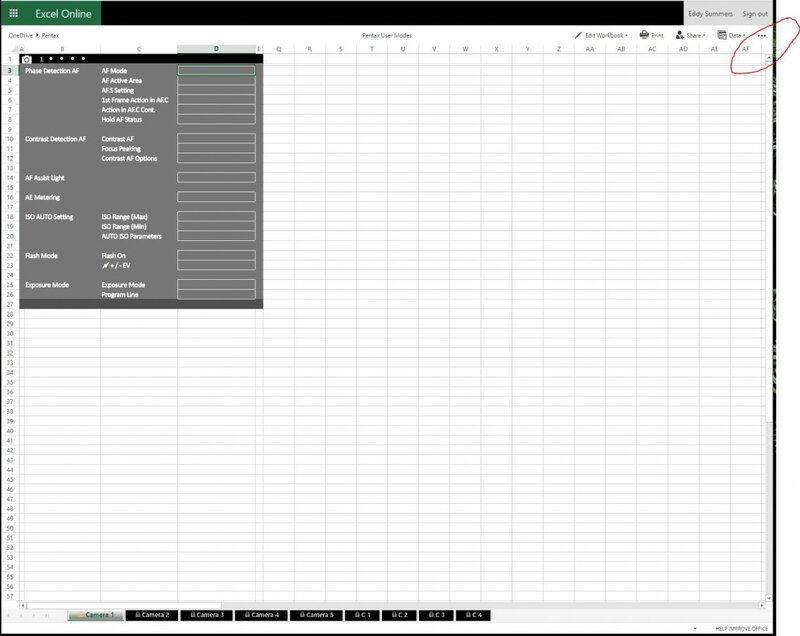 Ok... hold your breath guys (and gals) but yours truly has just finished the first draft of an Excel 'User Mode' spreadsheet for the K-1 camera! I know i know... please... try and contain your excitement! Ok, so I had to think a little bit about how to best present the spreadsheet and eventually decided to try and mimic the menu system of the camera itself I was modelling after (the K-1 in this case), that way I thought it might be easier for people to fill out fields and not get too lost and confused and easyish to double check that things are filled out correctly before sharing/storing etc. Why did I do this at all I hear you say?! Well... I find 5 User Modes pretty limiting to be honest, I could easily enjoy 4x that many, and whilst the K-1 has an unbelievable amount of customisation available (which I'm only just getting to grips with myself), nothing beats toggling a single click of a wheel to place the camera into a shooting mode/environment that works for that given scenario. Personally I find myself having to wander off my User Modes frequently to adjust to the event or environment I'm shooting at. Sometimes these adjustments are slight, sometimes quite far off from what I set them too. Afterwards I always wished I could easily revert back... well now you can! Store your User Modes here in this spreadsheet for quick reference, as a baseline from which to return to. I also really like the idea of sharing settings we've stumbled across or enjoy using for x,y or z scenarios etc. Perhaps if this idea takes enough traction a User Mode thread will be created (or renewed if one exists already) with feedback and trials of one anothers settings. And in doing so I'm sure a level of learning will occur, which in the end is paramount to all of us achieving the best results. Perhaps through a more in depth sharing of settings some of the more experienced can weigh in with what they see as a potential conflict in a setting to what the mode is actually trying to encompass etc. EDIT: it's also prolly worth mentioning that on first glance I missed out huge chunks also, such as video and playback, I wanted to get onto other 'life' stuff so left it for now to the settings that impact still photography and just the taking of the shot, not the reviewing etc. Last edited by BruceBanner; 03-02-2018 at 06:57 PM. Very well done Bruce, excellent work mate. my way of not losing this thread. Thanks! As I'm filling one out currently I realise sticking purely to the Menu settings in the camera actually omits some settings, such as Shooting Mode and Exposure Compensation. So I shall amend the Spreadsheet, reupload to reflect this info. Ok so by clicking this link here. You should see something like this, and then be able to access the menus i've circled below? Does this not present the same way to you? PS I shouldn't worry about it too much right now as it's incomplete (shooting mode omitted etc). I shall be updating it today, and then I'll share it via more links. Last edited by BruceBanner; 02-28-2018 at 01:48 AM. Thank you ! Now it works ! Shooting Modes, Custom Image, Outdoor View Settings, White Balance and Exposure Compensation now added. Noticed a bug on page 'Camera 5' that I'll get round to fixing. Fixed. Updated to add Video settings as well. What about the customizable control panel and the five  set-up menus? And how about using the camera symbol  as font like this? Last edited by angerdan; 03-03-2018 at 01:44 PM. What about the customizable control panel and the five 🔧 set-up menus? And how about using the camera symbol 📷 as font like this? What do you mean by customizable control panel? Ok, so the spreadsheet is essentially a single 'User Mode'. 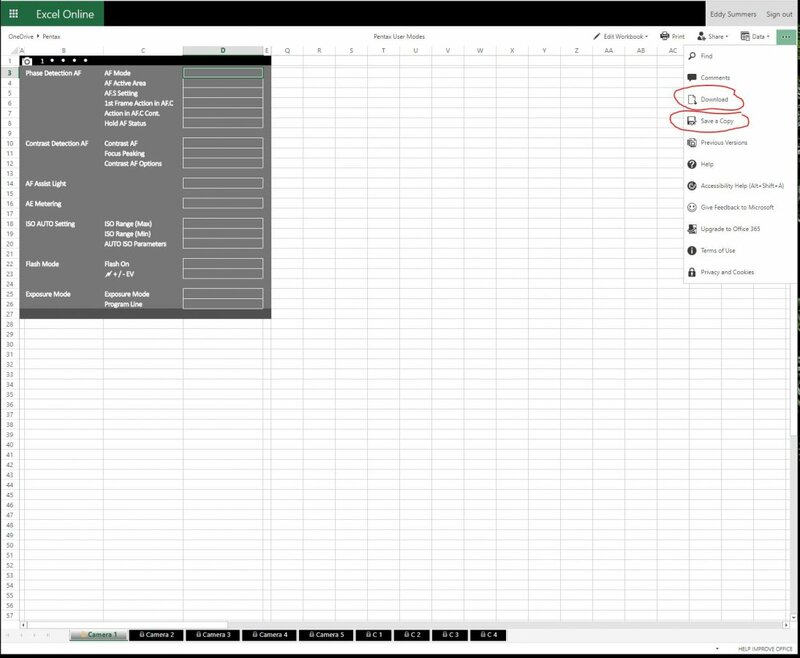 Make multiple copies of the spreadsheet, rename them what you like, for example I might rename one spreadsheet as 'User Mode 1 - Portrait with Live View'. Another spreadsheet might be renamed 'User Mode 2 - Birds' (with the settings reflecting that scenario of course) etc. When I first thought about how best to approach this concept I was thinking initially of having tabs at the bottom, User mode 1, 2, 3, 4 etc, but I really wanted to imitate the menu system that I see on the rear of the Pentax K-1, I thought when cross referencing and double checking things would be easiest when presented with this more visible direct comparison. So the spreadsheet evolved to using the tabs/sheets at the bottom to being the menu system rather than 'U1, U2, U3 etc etc' (Dial system). I figured you just make copies of the sheet and rename them and that's the User Mode/config you save/share with others. You could always set up the spreadsheets and compress to a single rar file, so when retrieving or sharing the rar file it unpacks to show 5 spreadsheets (or whatever). Now in regards to the graphic camera and wrench tools, I just stuck with what I found to closely resemble the symbols on the menu system of the K-1. You are more than welcome to delete them and use your own Just unprotect the sheet, click the camera icon, delete it and insert your own image, resize and put in it's place, and then reprotect sheet. Unfortunately the tabs at the bottom (circled blue) do not allow for any symbol or gfx inserted, just text here. Please be aware more settings 'appear' (circled red) when certain things are selected, and disappear again once the field is empty (hit backspace/delete to empty a field). Things I have yet to include are the Playback menu settings (Slideshow, Protect All Images etc) and the 5 settings (wrench tool) as you pointed out. I'm just working to a tight schedule currently so wanted to get the bits done that actually really impact the settings when shooting. Adjusting for Language, Date Adjustment, World Time etc, it doesn't really impact the shooting experience, so left a lot of that menu system out. But I will get around to it. I just thought I'd share where I am currently up to for feedback and impression and any bug reporting. I did test your tool on google spreadsheets, which i believe is a better solution (from usability and edit features/functions). Ah yes, the Info quick shortcut thing. Again I left that out as I felt it didn't really 'store' new information but rather just allowed users to quickly get access to some settings they use frequently. Hopefully all the settings that are presented there can also be seen in the spreadsheet somewhere else? The camera is a sneeky thing, initially I thought just doing the Menu system (camera 1-5 and some of the 'C' menu items would suffice), but only when I started to fill out the spreadsheet myself did I realise that such things as 'Shooting Mode' weren't actually in the menu system at all but rather only accessible from 'standby' mode. I think other cameras (like my KP) might be different and actually replicate some of that stuff in the menu system... will have to check. I do indeed plan to do a KP specific spreadsheet also, hopefully it won't need too much tinkering from the K-1 I've made. I actually want to start a sharing thread with this sheet, not sure if new thread or just start dumping here, prolly dumping here makes most sense. The idea of sharing is to perhaps help people stumble upon a setting that works really well for what they want to shoot (wildlife, portraits, landscape etc), as well as open oneself up for constructive criticism for a shooting mode they have created (ie is there any subtle contradictions in my settings somewhere, will I get better results if I toggle this setting off completely, or set to low etc). 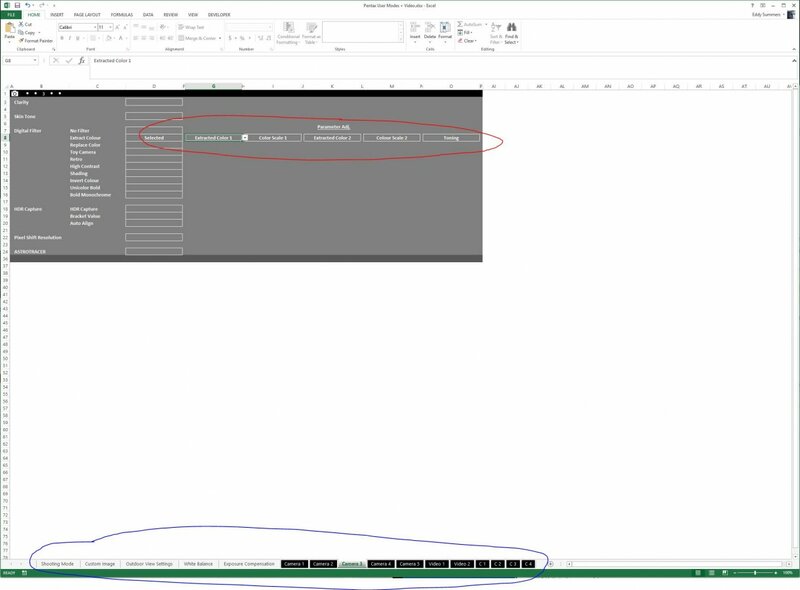 Or perhaps when explaining something to someone, telling them what this setting here does or that, using the sheet can pinpoint a little better exactly where the setting is located and what it does. Personally I use all my 5 user modes, when I want to ditch one I just want to store what it was last set at so I can revert back to at a later date if need be. Last edited by BruceBanner; 03-03-2018 at 04:04 PM. All times are GMT -7. The time now is 09:34 AM. | See also: NikonForums.com, CanonForums.com part of our network of photo forums!